A children's book on Amazon so enchanted me with its artwork and whimsical title that I decided to buy it even though I'm a grown up who doesn't have young children. This led me, as Amazon does, to other children's books with delightful drawings. I bought a total of six books. 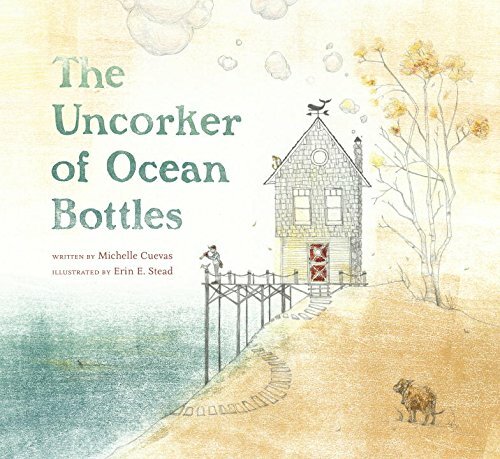 My favorite illustrations, from a purely aesthetic standpoint, are for The Uncorker of Ocean Bottles. It has an upbeat, cute story, but the imagery is the most appealing part to me. It is especially delicate with jewel-like earth tones that somehow look light and airy. Magical stuff. Two others resonated deeply with me, and they are excellently illustrated, but beyond that, their simple messages address issues I still struggle with as an adult. What Do You Do With a Problem? and What Do You Do With an Idea?, written by Kobi Yamada and illustrated by Mae Besom, pull together basic aspects of human existence with the immensity of their challenge and deliver not just hope, but anticipation, in facing them. Kobi Yamada runs an inspirational gifts company in Seattle called Compendium, where he has worked since 1992. Through that company, he published his first book, What Do You Do With an Idea? in 2014. There's an interesting and inspiring story on Publishers Weekly about his collaboration with Mae Besom. From Compendium: "What do you do with a problem? Especially one that follows you around and doesn't seem to be going away? Do you worry about it? Ignore it? Do you run and hide from it? This is the story of a persistent problem and the child who isn't so sure what to make of it. The longer the problem is avoided, the bigger it seems to get. But when the child finally musters up the courage to face it, the problem turns out to be something quite different than it appeared. This is a story for anyone, at any age, who has ever had a problem that they wished would go away. It's a story to inspire you to look closely at that problem and to find out why it's here. Because you might discover something amazing about your problem and yourself. What are problems for? They challenge us, shape us, push us, and help us to discover just how strong and brave and capable we really are. Even though we don't always want them, problems have a way of bringing unexpected gifts. So, what will you do with your problem?" "The difference between resilience and thriving is the recovery point. Thriving goes above and beyond resilience. Thriving finds benefits within challenges." That idea had never occurred to me in any form. That sentence, just five words evoking growth, bounty, surprise and difficulty all together, as a package and a win, is a precious treasure to me. I don't know that I would have recognized its value had I not read What Do You Do With a Problem? because I would likely still be of the unquestioning mindset that problems are meant to be solved and gotten rid of. At least I have been disabused of the notion that I shouldn't have any problems. I'd like to thank Buddhism for that one. Here is a terrific writeup by Dr. Joseph Bentley who relates, not only the wise Buddhist proverb about the 84th Problem, but also goes on to talk about their benefits, "...problems are important in our lives, even essential: growth, success, emotional vitality, courage, wisdom, thinking, perceiving and experiencing, learning, choosing and acting, are all associated with problem situations." All this is to say, I had some problems today, and I was afraid to ask myself why. This was a problem only in my mind, a feeling I got in a situation that I don't think bothered anybody but me, and I was annoyed that I had a problem with it. I wanted it to fly away and leave me alone. But, now I consider that it may be there for a reason. It may be an opportunity to grow, a way to connect with others, or it may give me a chance to be courageous. I don't know why you are here, but I welcome you, Problem. What gift do you bring?